There are many ways you can help to keep your thyroid active and healthy. Herbs are always a terrific option that should always be used first before dangerous and toxic pharmaceuticals are even considered. For those who have autoimmune thyroid or other types of thyroid conditions, it’s good to know which herbs can be used to help the thyroid return to a more normal function. Of course, in addition to adding herbs to your diet, it is vital that it be combined with other healthy lifestyle changes including managing stress, limiting exposure to toxins, getting regular sleep and exercise, and eating a healthy diet, avoiding sugar and processed foods in order for herbs to really work their magic. Simply adding herbs to an unhealthy lifestyle will rarely give one the results they are seeking. You don’t need to consume all of the herbs on this list. Some are best for those with hyperthyroidism, others for those with hypothyroid problems. Still others can be taken for either condition and others are meant to support those with healthy thyroids who want to keep them that way. It’s best to consult with your doctor or a natural healthcare professional before consuming any herbs, especially if you are taking prescription medications. Now, let’s take a look at the top 14 herbs that are known to have an effect on the thyroid. 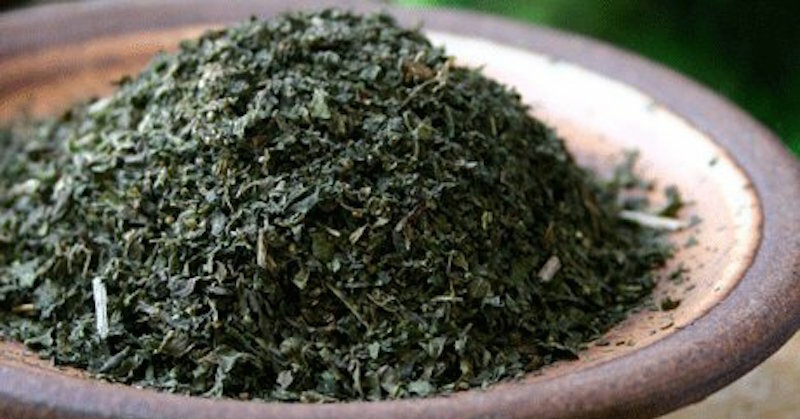 This herb works best for those who have an underactive thyroid. It helps to give the body energy, which makes it perfect for addressing the fatigue that often accompanies low thyroid function. Siberian ginseng is a gentle stimulant that will give you that boost of energy you want without the crash later on. Most people consume 200 mg per day, splitting the dose in two, taking 100 mg before breakfast and the second dose before lunch. Studies show that this little known herb can stimulate the thyroid enough so that it can fight the effects of hypothyroidism. Bacopa has been found to help regulate the function of thyroid hormone concentration by as much as 41 percent. No side effects at all have been reported with use of this herb. The super effective algae with a funny name. In addition to being super beneficial for those with hypothyroidism, this algae has high levels of natural iodine, which can help other conditions besides assist the thyroid. Bladderwrack has compounds that can help to restore the normal function of the thyroid, but it is known to reduce the size of goiters that are often found in those with thyroid problems. Bladderwrack is believed to be able to help prevent the development of thyroid disease because it stimulates the production of thyroid hormones. Although this algae or seaweed is often recommended to treat thyroid problems, very little is actually known about how it works. Recommended dosage is about 200mgs, but a doctor can help you decide what the perfect amount is for you. If you don’t care for seafood, or if you are vegetarian, then black walnut might be the answer you are looking for. Black walnut is the richest source of iodine next to seafood. Iodine is an essential nutrient that is vital to the health and proper functioning of the thyroid. In fact, research shows that low levels of iodine can lead to serious conditions in the body including depression, mental problems, chronic fatigue, and goiters. You might think of this herb as only for improving the immune system, but it is often recommended for those who suffer from hyperthyroidism. Experts have been giving their patients Echinacea root for more than 20 years to help alleviate autoimmune conditions and that they have experienced only positive results. This herb is most effective in alleviating mild hyperthyroidism and might be able to gradually replace prescription medications such as methimazole. One study gave bugleweed to 403 subjects diagnosed with mild hyperthyroidism. Subjects took an extract in either tablet or liquid form. Researchers noted that all subjects had significant improvement, both clinically and statistically, in their thyroid activity with no major side effects. This super gentle herb is a member of the mint family, and is considered to be super beneficial for the thyroid. Lemon balm can help normalize an overactive thyroid as it reduces the production of thyroid hormones and ease the symptoms that are often associated with hyperthyroidism. Ginger is terrific for settling upset tummies and stopping feelings of nausea and vomiting, but this herb is also a great source of zinc, potassium, and magnesium, all of which are important to the thyroid. All of the above listed minerals help to reduce inflammation in the body, which is important as well. Feel free to consume ginger any way you like, as long as you consume it fresh. Using fresh, organic ginger root to make tea each day is a simple way to get more of this important herb into your life. Stinging nettle is thought to be perhaps the perfect thyroid tonic, as it offers a balance between those suffering from an underactive thyroid or an overactive thyroid. Nettle is especially good for those with an underactive thyroid because it helps to reverse an iodine deficiency. Make your own stinging nettle tea by steeping one tablespoon of the dried herb to one cup of water for about 10 minutes. Drink two or three cups each day. This supplement is full of amino acids that are vital for the health of your thyroid. They can help improve the overall thyroid function and alleviate the symptoms for those suffering from an underactive thyroid, such as hair loss, dry skin, and heavy menstrual periods. Evening primrose oil also helps to stop inflammation in the body. Flax is super rich in essential fatty acids, especially omega-3 fatty acids, which are great for cardiovascular, brain, and thyroid health. The University of Maryland Medical Center conducted a study in which they found that those who ate diets high in omega-3 fatty acids, such as flaxseed, can help to improve the production of thyroid hormones. Even if you don’t have a thyroid problem, consuming flaxseed, or flaxseed oil supplements, can help reduce the susceptibility towards hypothyroidism. All it takes is about 1 tablespoon of ground flax seeds each day on an empty stomach, or one teaspoon of flaxseed oil. This herb has potent antioxidant compounds that are believed to directly affect the thyroid by helping it produce exactly the right amount of hormones. In this way, ashwagandha can help the body fight stress by boosting the immune system. It also has anti-inflammatory compounds that are also beneficial. In one study performed in 2011, extract from this herb was able to stimulate thyroid activity and enhance the anti-peroxidation of hepatic tissue. Licorice can help maintain perfect balance among different glands in the body so that those who suffer from thyroid issues will have improved energy levels. The Institute of Biosciences and Technology in Texas were able to isolate synthetically derived constituents of a certain type of acid found in licorice. By doing this, researchers found that this acid (triterpenoids glycyrrhetinic acid) arrested the growth of very invasive thyroid cancer cells in a study performed and published in 2011. This study shows that this herb has the potential to be an effective means of treating thyroid cancer and/or other endocrine related problems. Although not an herb, iodine is crucial for the proper function of the thyroid gland. Iodine levels must be increased if your thyroid is underactive. There are plenty of supplements you can consume that will help with this. Alternately, you can eat certain foods or some of the herbs listed here to help replace iodine in your body. Foods that are rich in iodine include eggs, meat, fish, kelp, seaweed, and potatoes. As we mentioned earlier, using one or more of these herbs can help to restore proper thyroid function, but they may carry some risks, which is why it is best to not self-treat your condition. Take this list to your physician or a natural endocrine doctor and discuss how you can use them for optimal results.